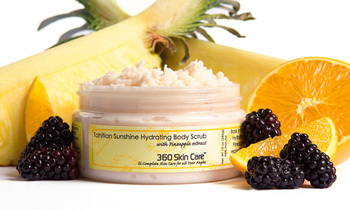 Bask in the brilliant bright rays of the sun with 360 Skin Care’s Tahitian Sunshine Hydrating Body Scrub. Scour away lackluster skin with the enzymes found in Pineapple extract. Pineapples invigorate the skin while hydrolyzed proteins replenish nutrients. This exfoliating hydrator conditions the skin with decadent ingredients while restoring your skins youthful appearance.